Tourists flock to Lincoln County communities along Oregon’s scenic coast, looking for glass floats and flying kites. While visitors may take long walks along the beach or along the many miles of trails in three Oregon state parks, residents have a harder time including exercise into their daily routines. Fewer than 20 percent of adult county residents meet Centers for Disease Control and Prevention (CDC) guidelines for physical activity. About 30 percent of Lincoln County adults are obese, and three-quarters do not eat the recommended servings of fruits and vegetables. Unsurprisingly, about 65 percent of Lincoln County adults have one or more chronic diseases. Lincoln County Health Promotion Program Manager Nicole Fields realized that she needed to take a different approach to updating the county’s Community Health Improvement Plan (CHIP) if county leaders wanted to take a more systemic approach to addressing chronic disease. She jumped at the chance to participate in the second Oregon Community Assistance Planning Program (CAPP) supported by the Planners4Health project from the American Planning Association and the Centers for Disease Control. “We applied for the Ps4H project to learn more about how public health can be viewed through a planning lens and explore new partnerships within our community. We were just in the process of launching our physical activity and nutrition programming so the workshop came at a great time for us to learn and grow our programming with the assistance of planning.” said Fields. 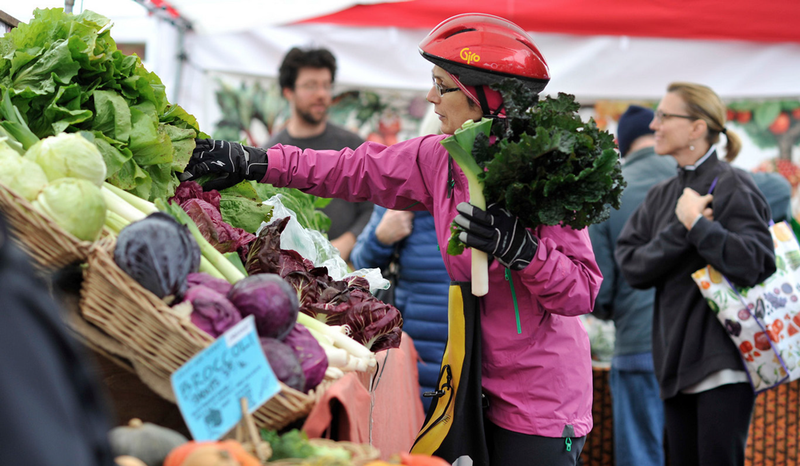 Bicyclist at farmers' market in Oregon. Photo courtesy Fred Joe Photography. Build awareness and make connections. There is a need to improve the profile of the importance of communities designed with health outcomes in mind. The county can do this through a speaker series, working with students, storytelling, and leveraging existing resources and activities. Broaden the assessment. Historically, county CHIPs have focused on traditional areas of public health and personal responsibility. County stakeholders realized there is significant potential to improve the built environment so that it is easier and safer for residents to commute to school and work by walking and biking, as well as improving the access to healthy food. 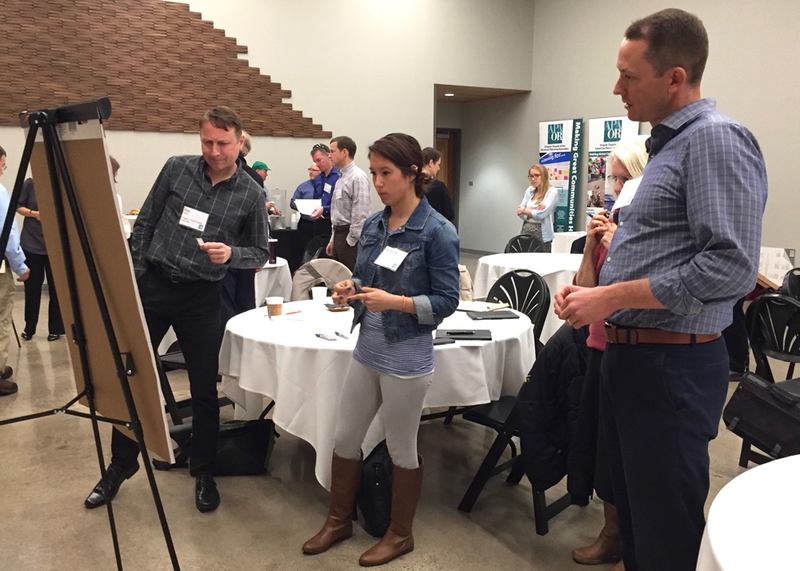 Local planners highlighted the activities they are doing to improve active transportation and a willingness to work collaboratively with public health officials. Be the convener. Workshop participants acknowledged the power of numbers and that they can do much more together than they can separately. Share and collaborate on policies. Public health and planners acknowledged that they must better understand the policy and regulatory framework of the other profession in order to work more effectively together. They different avenues to do this, including the promotion of a Health in All Policies model for the county. Prioritize funding. All participants realized the fastest and most effective way to improve health through planning is to fund policy, infrastructure, and programs. Make the business argument. Stakeholders also acknowledged that one of the most effective ways to build support is by making the economic development argument. Communities designed for health often benefit local businesses, especially those dependent on tourism. Champions ensure success. It is important to have dedicated staff to run, and champion, programs. Housing is a health issue too. Many Oregon communities are experiencing a housing crisis and Lincoln County is no exception. There is a need of healthy housing — free of mold and leaks and energy efficient — as well as affordable housing that gives residents more resources for healthy food, medicine, and transportation, in Lincoln County communities. Planners and public health professional convene to discuss cross-sector strategies. Photo by Becky Steckler, AICP. Jean Crowther, AICP Senior Associate, Alta Planning & Design, Inc.
Professional planners volunteering their time see that their efforts can have a significant impact on communities. “Although the Lincoln County project happened in a very condensed timeframe, it still resulted in important connections between public health professionals and planners that might not have otherwise occurred. This goes to show that even small-scale efforts can spark important conversations,” said Aniko Drlik-Muehleck said. The Lincoln County CAPP Project was part of a larger effort funded by the American Planning Association and the Centers for Disease Control and Prevention. The Oregon Planners4Health Project published an assessment of health and planning in Oregon in September 2017. Oregon is now the seventh APA chapter to start a program that assists communities with pro bono planning services. If you're interested in starting a program at the chapter or division level, please visit the CPAT resources page that includes a webinar presented by chapter members from around the country involved with pro bono programs. You can also learn more about APA's Community Planning Assistance Teams program here. Top image: May 2017 Bike and Walk to School Day in Oregon. Photo by Becky Steckler, AICP. Becky Steckler, AICP, is Urbanism Next program manager at the Sustainable Cities Initiative, University of Oregon.